Stalin said the raids at the residence of party treasurer Durai Murugan in Vellore district was part of a plan to prevent the candidate from campaigning. 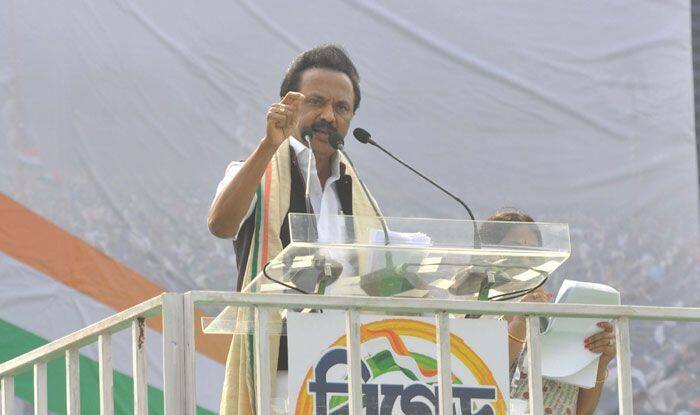 DMK president MK Stalin on Wednesday said he suspected that there could be a “conspiracy” to countermand by-polls to two assembly seats in Vellore Lok Sabha segment, where IT raids were conducted. Reports reaching him suggested that plans were afoot to countermand the by-elections to Ambur and Gudiyattam so that the ruling AIADMK could continue to govern, he alleged. The raids at the residence of party treasurer Durai Murugan in Vellore district on Saturday was part of a plan to prevent the candidate from campaigning, he told a massive gathering in Perumanallur, some 60 kms from here in Tirupur district while seeking votes for CPI candidate K Subbarayan. Durai Murugan’s son Kathir Anand is contesting from the Vellore Parliamentary constituency. He doubted whether those who conducted the raids brought the huge sum of money themselves and later announced that they had recovered crores of rupees from two premises, including a cement godown. Income Tax sleuths had seized Rs 11.53 crore cash from a cement godown belonging to a DMK leader’s associate in Vellore district on Monday. The development came after tax sleuths raided the premises of Duraimurugan in Vellore and seized Rs 10.50 lakh. Stalin also sought to know why polls to three assembly constituencies (Tirupparankundram, Aravakurichi and Ottapidaram) and now vacant Sulur constituency was not declared. He alleged that the NDA government’s “wrong economic policies” like GST and demonetisation had led to a host of problems for industries in Tirupur and left thousands jobless. DMK, which released its manifesto on March 20, also promised to waive loans of agriculture workers, who have taken gold loans pledging up to five sovereigns of ornaments, Stalin said.